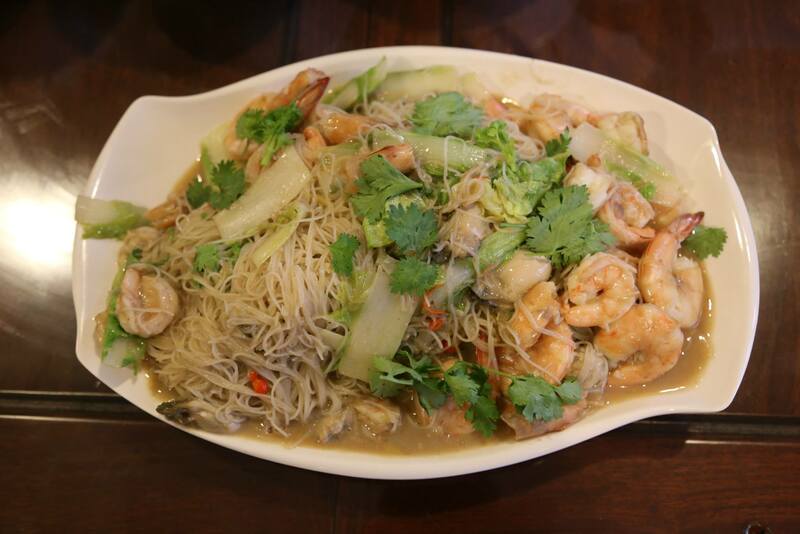 “crabless” beehoon 1 of the 3 “newer” dishes i did for my friends at a 9pax homecooked lunch yesterday on 9.3.2015.
i first did this Prawn & Oyster Beehoon (the Crab Beehoon Style) 2 weeks ago, inspired?? or more correctly spurred on by the disenchanting experience with crab beehoon at seng kee the few of us had recently. i fried some chopped shallots, garlic, 2 chilli padi & 1 cm sliced ginger in oil in a wok on medium to a nice aroma. then i added the cleaned chinese cabbage & fried till it softened, and added some fish sauce. i removed the vegetables and added about 300g of beehoon softened in cold water & stir fried a short while. then i added the prawn stock together with the unshelled prawns & turned the fire up to reduce the stock. i added 2tablespoon of oyster sauce & 1 tablespoon of cornflour. once the stock was reduced and checked for taste & making sure the beehoon was not overcooked, i added the oysters & some cooked prawns (which i butter-fried earlier), covered it with the beehoon, let it cooked for very short time & off the fire. it was a very delicious dish!^^ may not be really so outstanding, but it was still probably better than seng kee’s which was more like a singapore fried beehoon than a crab beehoon. This entry was posted in Recipes and tagged "crabless" beehoon, chilli crab angel hair (w/o crab), crab beehoon, curry chicken noodles, Prawn & Oyster Beehoon, Seng Kee. Bookmark the permalink.